A week ago today Ford celebrated 100 years of the Pickup Truck! It’s safe to say that the pick-up truck has become an integral part of America and its car culture, however over the years it too has become just as popular in the UK. So, we wanted to celebrate 100 years of the Pickup Truck with you and give you a brief history about where it all began in 1917. 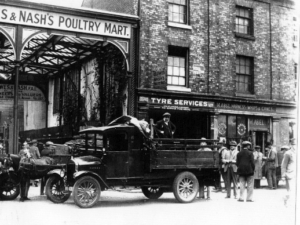 On the 27th July 1917 Ford introduced its first purpose-built truck, the Ford Model TT. Little did they know it would forever change the auto industry. 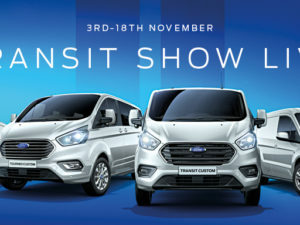 The birth of the Model TT came about when Ford noticed that their customers were asking for a vehicle that could carrier heavier loads and provide greater utility for work and deliveries. The Model TT had the same cab and engine as the Model T, released nine years before. The TT came with a heavier-duty frame allowing customers to carry one tone of payload and by 1928 Ford had sold 1.3 million Model TT’s, it was clearly a success. Soon the Model AA replaced the TT, the AA was marketed as having a certain class where customers could use them on the farm yet still take them to church on Sunday. The Model AA was available exclusively as a chassis cab offered in two lengths, with new powertrain and axle options for greater capacity. 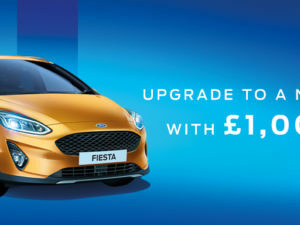 It’s fair to say the AA was a step up from the TT, however for Ford to stay ahead in what became a competitive business they needed to step up their game. In 1933 Ford released the more capable Model BB, which were mainly designed to be mail and freight vehicles, ambulances and stake trucks. 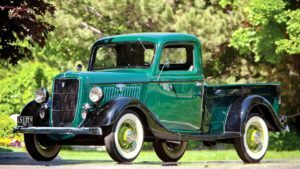 Just two years later, Ford introduced the Model 50 pick-up powered by its famous Ford Flathead V8 engine. During the war there was a loss of consumer sales however Ford continued to build heavy-duty military truck chassis and four-wheel-drive personnel carriers throughout this time. A re-brand of the series also brought a change to the design and the technology of the classic pick-up. Two-tone paint was introduced, as well as automatic transmissions and improved heater and radio. Comfort was considered when the F-100 arrived in 1953, the pick-up included armrests as a standard feature. 44 years after the Model TT, the fourth-generation F-Series arrived and in 1965 the company’s revolutionary twin I-beam front suspension debuted. Comfort, durability and value were all considered when Ford introduced an upscale Ranger package in 1967. In 1977, three words were spoken by a copywriter for Ford truck magazine – Built Ford Tough. Three simple words were more than a slogan for Ford, they were a brand promise when it came to the F-Series. In 1998 Ford reset the benchmark by introducing the F-Series Super Duty. The series was engineered for fleet and heavy-duty work use. Not only was the design getting even better for the lineup of F-Series trucks but the technology was too. 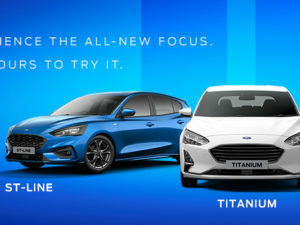 Ford added high-end trim and technology packages to these vehicles, meeting their customers diverse needs. Luxury, functionality and capability were provided in the King Ranch, Platinum and Limited model trucks with premium leather heated seats and SYNC with navigation. 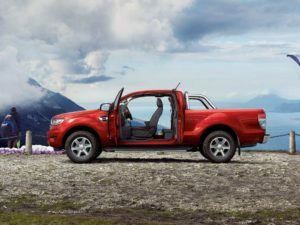 Ford are, to this day, continuing to create the best pick-up possible and we definitely believe they are succeeding!